Chagrin d’amour is a French pop duo, often hailed as the artists to record the first French hip hop album. 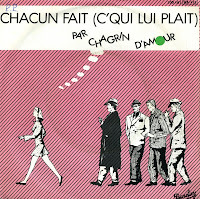 In 1982, they released 'Chacun fait (c'qui lui plait)', a single taken from their debut album of the same name. It was probably the first ever French rap single. The single barely missed the Dutch Top 40 in 1982. I had vague memories of this song when I bought the single and was slightly disappointed: beside the catchy chorus, there isn't much else.